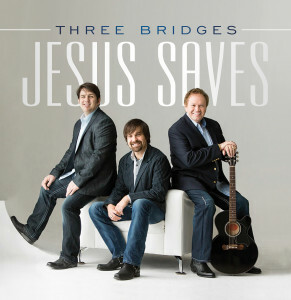 The award winning Gospel trio, Three Bridges is releasing their 4th project with the Mansion Entertainment label and is titled, Jesus Saves. 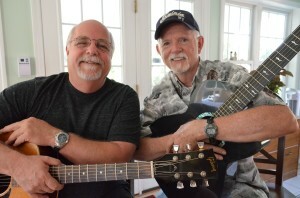 Click on the group name above and a sampling of the entire collection of songs can be heard. Brand New – a foot tapping song with a lyric that every “long time pilgrim” will appreciate! Unknown Soldiers– a powerfully moving tribute to those who have served our nation in the military. Steve wrote this song with our east-Tennessee friend and fellow songwriter, Dana Bacon. See a picture below of the two buddies in their element and loving every minute of it. Three Bridges is made up of Elliott McCoy, Shannon Smith and Jeremie Hudson. 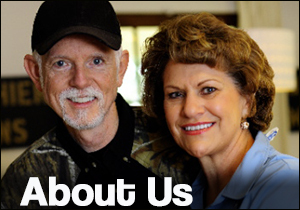 All three are great singers who pool their voices to make a blend that is rich and unmistakably identifiable. Other songs on the CD are, Jesus Saves- Never Fades (title cut), Satisfied, The Lord Will Make A Way Somehow, A Time Such as This, Livin’ Forgiven, When God Does the Doin’, Made Up Mind.